There’s nothing like starting a new adventure and catching a plane to a new destination. Whether you’re exploring the US or saving up all year to explore a new country, traveling helps connect us to the rest of the world and lets us experience what it’s like to live in someone else’s shoes. Maybe you are the definition of #wanderlust, always plotting away at your next travel destination—or maybe you are the epitome of a homebody, skipping the time and money that it takes to travel. As it turns out, where you live in the country may determine how much of the travel bug you have. We wanted to figure out which states throughout the country were always jet-setting away to a new place and which states were perfectly fine with sticking close to home. To find out, we used Google search trends data to identify the states searching travel-related phrases most often, per capita. Here are the most and least well-traveled states in America, according to the data. Everyone knows someone who is the ultimate jetsetter; someone who you always think, “Is that person ever home?” Which states around the country are home to those ultimate wander lusters who are always looking for their next adventure? According to our data, the No. 1 most well-traveled state in the country is California, followed by Connecticut, Illinois, Nevada, and Florida, which rounds out the top five. Coming in at No. 6 is Hawaii followed by Alaska at no. 7—which of course makes sense if they have family who live on the mainland of the country. At No. 8 is Michigan, whose residents are probably trying to escape the harsh winters in favor of a tropical island. Following Michigan is Colorado at No. 9 and Virginia, which completes the top 10. At No. 11 is Massachusetts, followed by Arizona, New York, Kansas, New Jersey, Maryland, South Dakota, Washington, Maine, and New Hampshire, which makes up the rest of the top 20. As for the remaining top 25—or the top half of the most well-traveled states in America—we have Oregon coming in at No. 21, followed by Texas, Nebraska, Delaware, and North Carolina. 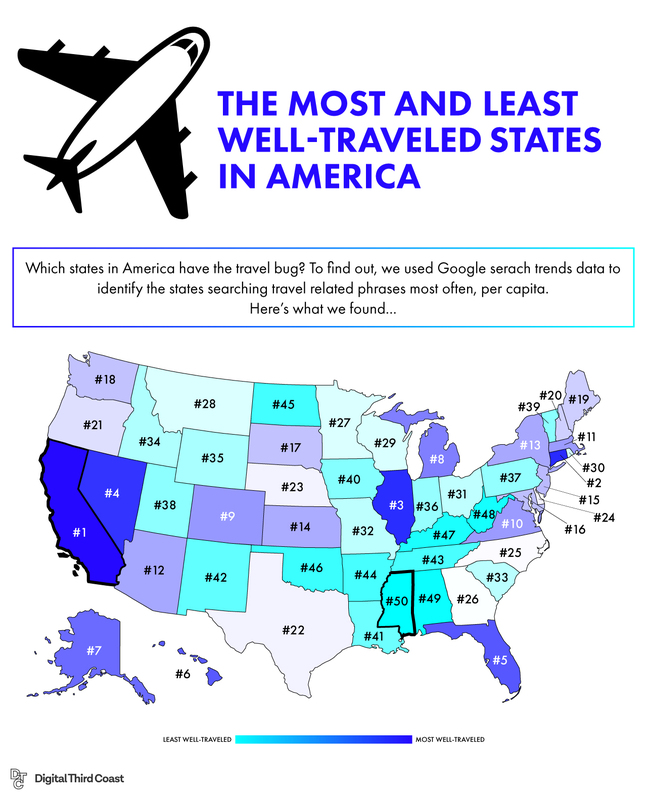 Now that we know which half of the United States does the most traveling, we also wanted to find out which states did the least amount of traveling. Whether they consider themselves homebodies, they prefer to spend their money on other things, or simply don’t have as much access to large airports, these are the states who travel the least in America. Coming in at No. 50 is Mississippi, which is preceded on the list by Alabama, West Virginia, Kentucky, and rounding out the bottom five is Oklahoma. At No. 45 we have North Dakota, then Arkansas at No. 44, which is preceded by Tennessee, New Mexico, Louisiana, and then finally Iowa comes in at No. 40. For numbers 39–30 are Vermont, Utah, Pennsylvania, Indiana, Wyoming, Idaho, South Carolina, Missouri, Ohio, and Rhode Island. Those right in the middle of the pack travel-wise were Wisconsin, which came in at No. 29, Montana at 28, Minnesota at 27, and Georgia at No. 26. Through all of our data, we can make out some interesting patterns by looking at the map. Many of the least-traveled states are located in the southeastern portion of the United States, which are typically lower in socioeconomic status and who don’t have as much access to airports. Interestingly, Texas and Georgia, who come in at No. 22 and No. 26 respectively, aren’t as high up on the rankings as you would think, considering that Georgia is home to the biggest and busiest airport in the country (Hartsfield-Jackson Atlanta International Airport) and that Texas is home to the busy Dallas/Fort Worth International Airport as well as George Bush Intercontinental airport. California was predictably in the No. 1 spot as they are home to LAX, SFO, and many tourist destinations that they can reach in a short flight. Also unsurprising were Illinois, Nevada, and Florida, who also have many tourist destinations—and therefore several options for travel. What was most striking, however, was the fact that Connecticut came in on our list at No. 2, as the Hartford airport and the New Haven airport aren’t necessarily as bustling as nearby New York City’s JFK or LaGuardia airports.